Wind racing through his hair and legs pumping, Dr. Victor Breedveld, an associate professor of engineering at Tech, was determined to reach the finish line. This was not his first race by a long shot. As an avid runner who had finished 5Ks and marathons alike, Breedveld was sure he could place in his age group. 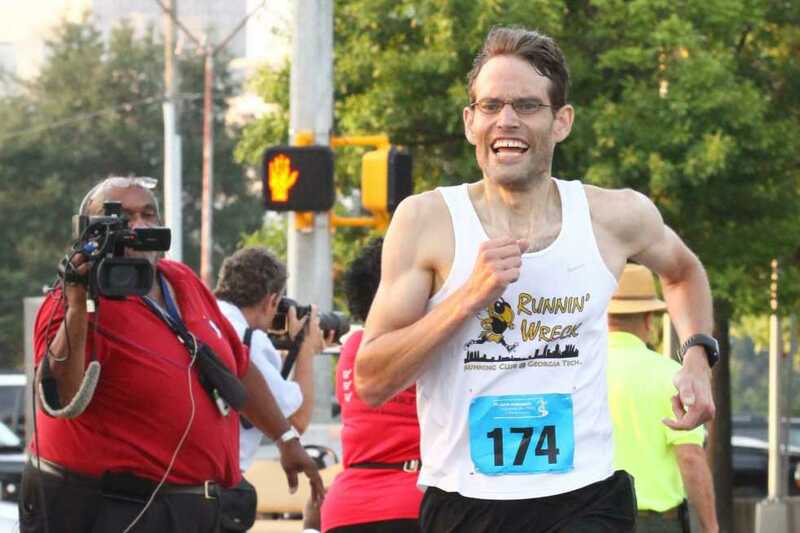 But as each runner, young and old, fell behind him in quick succession, he became determined to not only win his age title, but to win the entire Kaiser Permanente Corporate Run. And it was with a broad smile on his face that Breedveld crossed the finish line before anyone else. While inside the classroom, Breedveld is thought of as a professor above anything else, outside of it, Breedveld is women’s roller derby coach, Runnin’ Wreck faculty advisor and a competitive runner. Recently, he sat down the with Technique to discuss everything from training regimens to advice for new runners. What is your current position at Tech and how long have you been a part of the university? I am an associate professor in Chemical & Biomolecular Engineering and have been at Tech as a faculty member since 2003. Where did you do your undergraduate and graduate studies? I attended college in the Netherlands, where I obtained all my degrees from the University of Twente (MS and PhD; they didn’t give out a BS to engineers when I graduated). What brought you to the Institute? The faculty job. I spent a few years at the University of California at Santa Barbara as postdoctoral researcher and while there applied to faculty positions across the U.S. Tech made me the offer I could not refuse. You recently defeated thousands of other runners in the Kaiser Permanente Corporate Run. How long have you been running and how did you get started? I did not run in high school or college and only started running somewhat seriously in 2004. I met a group of local runners on the Tech track during a lunch run. I joined them for an early morning run the next week and the rest is history: they have been my training buddies ever since. Through them, I joined the Atlanta Track Club, where I slowly worked myself up to becoming a member of the competitive teams, first the Open Team and now that I’m officially “old,” the Masters Team. Although I consider myself a good runner, I have never been superfast. I often place in local races and win age group awards regularly. Occasionally, when all the real studs don’t show up, I’ll win one overall. Have you done any races like this one in the past? I run a fair number of races per year, ranging from 5K to marathon. The problem with marathons is that they require too much preparation time if you want to race them seriously and make you hurt for a long time afterwards. One of my key annual races is the Pi Mile on campus in April, where I have won the “fastest faculty award” for nine out of the past 10 years; the only year I missed the Pi Mile was in 2011 when I ran the Boston marathon two days later. Was your training regimen for this competition any different than those in the past? Since turning 40 earlier this year, I have ramped up my training intensity and focus a notch. Being “old” as a runner opens up the opportunity to compete in new races, which is very motivating. In June, I ran the 8K National Masters Championships in Williamsburg with the ATC team where we won the team title; next week, I’ll be in Syracuse for the 5K Masters National Championships. It is pretty cool to compete at the national level. What were your thoughts when you crossed the finish line? Did you anticipate such a victory? The Kaiser Permanente Corporate Run is a race that I have run many times. We have won the team competition a couple of times with the Tech team. Individually, I had been in the top-10 a few times, but never close to winning. This year, I went into the race with the ambition to compete for the Masters title. I started the race fairly conservatively, and was seventh after mile one, mainly keeping an eye on other old guys. Then the young runners in front of me started falling back one by one; with about a mile to go, it became clear that I could place in the top three. I entered the last half mile in the lead and was determined not to let the young legs outkick me anymore. It worked out and I was truly amazed that I had managed to win the race. It was just one of those days when everything comes together perfectly—one of the best days in my running career. Aside from running, what other things do you enjoy doing when you’re outside of the classroom? I enjoy the outdoors, mostly through hiking. I also coach a roller derby team, the Sake Tuyas, one of the home teams of the Atlanta Rollergirls. My wife has been an avid roller derby skater for many years and she has sucked me into that world; now I coach the team she plays on. If you could run alongside anyone, dead or alive, who would it be and why? Most of the interesting people from past and present that I’d like to meet would probably be too out-of-breath to carry a good conversation while running, so I’d rather have coffee or a beer with them to savor the moment. When I travel for work or pleasure, I usually bring my running shoes and explore new cities that way. I often wish that I had a local tour guide or history buff running alongside me to tell me more about the places I run past. How has such an active lifestyle benefited you beyond a physical standpoint? For me, the main non-physical benefit of running (and commuting by bike) is that it keeps me sane; going for a long run along the Chattahoochee River or at Kennesaw Mountain is peaceful and relaxing, especially when you do it with a great group of friends. When injuries limit my running, I slowly but surely go stir-crazy. What would your advice be to students looking to become more active or maintain an active lifestyle while at the Institute? Make exercise part of your social life: Find other like-minded people to run or work out with. There are always good excuses to skip a work-out, but if you made a commitment to someone else you’ll go anyway and feel good about it afterwards. I am also the faculty advisor of Runnin’ Wreck, an informal student running group at Tech. They participate in races, but also meet for group runs at the CRC bus stop every Monday, Wednesday and Friday at 5:30 p.m.. Runners of all abilities are welcome; they will guide you around town for runs of different lengths and paces.